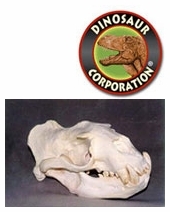 Museum Quality Pinnipedia Skulls replicas are cast in durable Polyurethane resins. Made in USA. Sea Lion Skulls, Seal Skulls, Walrus Skulls. Recent molecular evidence suggests that Pinnipeds evolved from a bearlike ancestor about 23 million years ago during the late Oligocene or early Miocene epochs, a transitional period between the warmer Paleogene and cooler Neogene period.